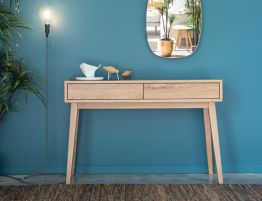 With a casual chic feel, the Copenhagen modern solid Oak Hall Console table adds something special to your interior design. 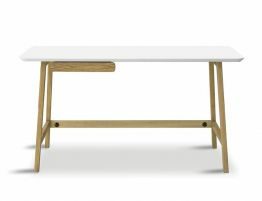 The Copenhagen furniture collection of which this accent table is a part of, deftly marries Danish inspired design, expert construction and the beauty of natural solid Oak wood. 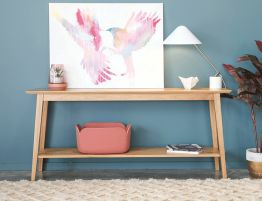 The console table’s two drawers are ideal for housing keys, wallet and other miscellanea so they don’t clutter your space. 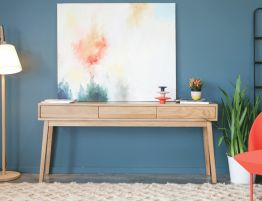 This console accent table looks great in your hall, behind your sofa or adding appeal to an accent wall. 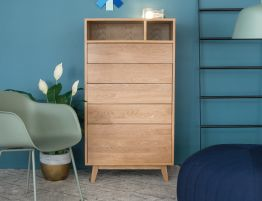 The minimalist modern Scandinavian design here is highlighted with timeless elements like handle-less one touch pop open drawers and a natural oak finish showcasing the wood’s natural grain. 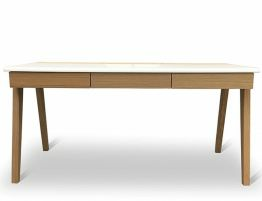 The Copenhagen console table is fashioned from solid oak lending it a weighty, well made feel. 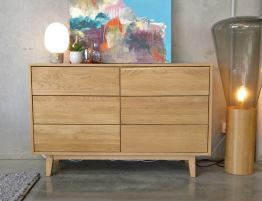 Showcasing the best of natural materials like oak and simple clean lines has created a sought after, malleable modern furniture collection.